1. Beat butter at medium speed with an electric mixer until fluffy; gradually add sugar, beating well. Add egg yolks, 1 at a time, beating until blended after each addition. 2. Combine flour and baking powder; add to butter mixture alternately with milk, beginning and ending with flour mixture. Beat at low speed until blended after each addition. Stir in vanilla. 3. Beat egg whites at high speed with electric mixer until stiff peaks form; fold one-third of egg whites into batter. Gently fold in remaining beaten egg whites just until blended. Spoon batter into 3 greased and floured 9-inch round cake pans. 4. Bake at 350° for 18 to 20 minutes or until a wooden pick inserted in center comes out clean. Cool in pans on wire racks 10 minutes; remove from pans, and cool completely on wire racks. 5. Spread Lemon Filling between layers. 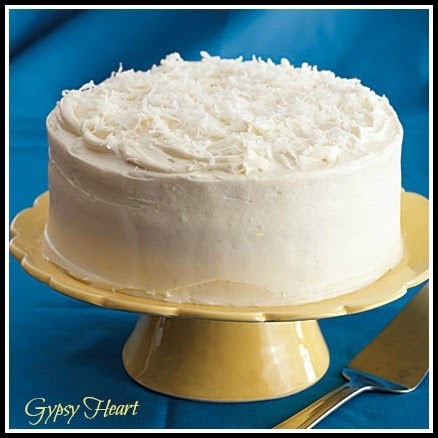 Spread Cream Cheese Frosting on top and sides of cake. Sprinkle top and sides with coconut. 1. Beat butter and cream cheese at medium speed with an electric mixer until creamy. Gradually add powdered sugar, beating at low speed until blended; stir in vanilla. I hope you'll try it ~ you will be glad you did, I promise! Mmmm, lemon and coconut - two of my favorite flavors! And so pretty too! Hi, Pat... Am playing cat up, and I had to stop in when I saw this gorgeous cake. Yum! I definitely want to copy this. Sounds divine! I'm with Sharon. These are seriously two of my favorite flavors here Pat. It looks mouth watering, I can't wait to make this. OH MY, I want a piece RIGHT now:) I LOVE Coconut ANYTHING! Have a blessed weekend dear friend, THANKS for the recipe! HUGS! This would be a GREAT recipe for that special cake to take somewhere! I may have to print off the recipe! Thank you!!! Bet it smells heavenly! Oh Yummmm!!! What a lovely cake. I'm visiting from Michael's Foodie Friday party. Nice to find you - I'm off to see more of your blog. Visiting from Rattlebridge. This looks a cake to make when company is coming or I would eat it all by myself. Sounds like a winning combination. Your cake looks so pretty - my layer cakes always come out lopsided. It's a very good thing, that I have to live gluten and dairy free. Because if I didn't, and got near to such a marvelous dessert, I'd want to eat the whole thing. I am not making the dessert for our dinner party - someone else offered. Sweets are actually the only thing I am good at making. What a fabulous cake!... it looks like I want a piece right now! Thank you so much for the récipe, it'll be my next birthday cake to make! Have a lovely week ahead. Oh yummy Pat!Great recipe. Thanks for sharing. 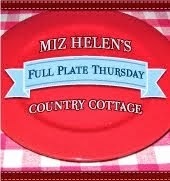 Your recipe is featured at Full Plate Thursday this week. Have a great weekend and enjoy your new Red Plate!